Yesterday, the Kings swapped Andrews – sending Bodnarchuk back to Manchester and calling up Campbell. – Kings GM Dean Lomabrdi solidified his reputation as ‘Dealer Dean’ at the 2008 NHL draft when he swapped picks in the first, second, third, fourth, sixth and seventh rounds. In that third round, he moved up from 84th to 71st so he could select Campbell out of the OHL. For trivia buffs, the third round pick traded away originally came to Lombardi in February 2007 when he sent Sean Avery to the New York Rangers. – Offensively speaking, Campbell has never come close to the numbers he put up his final year of junior hockey. While playing for the legendary Soo Greyhounds, he posted 13 goals and 35 points (second best among the team’s defensemen). Since turning pro the following season, three goals has marked his best campaign. However, his point totals have crept up during his time in Manchester, topping out at 19 last season. – Plus-minus is an area where Campbell, known more as a stay-at-home defenseman, has shown tremendous improvement. His five year stat line with the Monarchs reads as follows: minus-15, minus-16, plus-12, plus-14 and most recently, plus-11 (which led Manchester at the time of his call-up). – His three-year entry level contract expired in the summer of 2008. Campbell then signed a one-year deal and re-upped with the Kings for two more years this past July. He now requires waivers though. So, if the Kings try to send him back to Manchester, he’ll be exposed to the other 29 NHL clubs first – [corrected] with two excpetions. there is a ’30-day / 10-game’ exclusion. Last month, Campbell cleared waivers when the Kings had to put several players there after the new CBA was ratified (of course, they lost Thomas Hickey and Rich Clune at the time). So, if he is sent back before February 15 or before he plays 10 games, Campbell will not require waivers to go back down. – Campbell participated in Jordan Nolan’s ‘Day with Stanley Cup’ – as shown here, in some pics supplied by his former roommate, Ray Kaunisto. 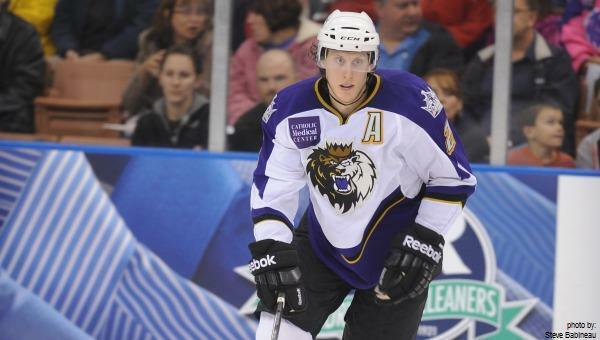 – During his time with the Greyhounds, Campbell was a teammate of – and often paired with – fellow Kings blueline prospect Jake Muzzin. With his arrival, this marks the fourth former Soo player on the Kings’ current roster, joining Jeff Carter and Jordan Nolan. – Also from his time in the OHL: Campbell played against several of his new teammates – including Nolan, Trevor Lewis and Kyle Clifford. – Campbell turned 25 this past Monday. Other players born that day include Brad Richardson and a pair of former Kings – Manny Legace and Jerred Smithson. Also celebrating the same day was Hall of Famer Denis Savard, a long-time teammate of Darryl Sutter with the Chicago Blackhawks. – His professional debut came against the Springfield Falcons on October 19, 2008 and Campbell played his 250th AHL game vs the same team on December 10, 2011. – Campbell’s teammates awarded him the Mark Bavis Unsung Hero Award each of the last two seasons. During those campaigns he served as one of the Monarchs’ alternate captains and suited up for all 76-games both years. To hear Monarchs coach Mark Morris talk about Campbell on the MayorsManor Radio show, click here. All three of the other former Greyhounds mentioned above have also been on the show recently, here are some links for your listening pleasure: Carter, Muzzin and Nolan.